Henry had this three year check up on Friday. I knew he would be great during the visit (unlike Isabelle who screams bloody murder at the mere chance she might get a shot) and I already knew what to expect since I had a 3 year old last year as well. It’s still challenging though to get him undressed, assure him the blood pressure cuff won't rip his arm off, hold him during finger prick blood work, and do the eye test while having the other two kids in tow. I remember last year when Isabelle had her 3 year eye test and she was a wiz at it. I also knew that Henry would not be a wiz. Henry is sweet and adorable and can play independently for hours. However, ask him to complete a simple task and it can be a challenge. Me: Hey, Henry, can you pick up that dinosaur on the floor? Me: The dinosaur, right by your feet. Can you pick it up? Me: Look down…it’s almost touching your feet….the dinosaur. RIGHT THERE!! Henry: (Looking around the ceiling) I no see it. Okay, back to the doctor’s office and the eye test, they bring us down the end of the hall and have Henry sit in a chair and show him a few shapes that will be on the cards: Circle, House, Square, and Apple. Perfect, he’s got all the shapes down so the nurse heads a bit down the hall to start the test. I cover one of his eyes with my hand which means I need to let Daniel run wild. The nurse says, “Okay, Henry, what is this first shape?” Henry proudly and loudly declares, “Octagon.” It was then that I knew just how the test was going to go. Let’s recall that octagon wasn’t even a shape on the cards! The test continued on like this with Henry calling out random shapes, staring off at the ceiling, trying to pull my hand away from his covered eye, etc. Meanwhile, Daniel is trying to remove a fire extinguisher from the wall. Isabelle had been very good until I start hearing her say things like, “Henry, it’s a house” in a whispered voice. The nurse finally bribes Henry with a prize if he can just focus and complete the test. 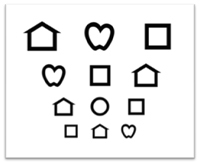 Oh, and for the record there were only 8 objects (4 shapes total) on the cards yet it felt like the longest eye test ever! At the end, the nurse said, “I think his eyes are fine but that maybe he’s just a bit young for the test. It's okay, I’ll pass him.” I’m pretty sure he could have been blind and she would have passed him just to get us out of there!